I don’t want to put them in a crate! Keep them safe – don’t lose them! Why do they need to start in a sanctuary space? Imagine finding yourself in a strange place with giant monsters. You may have seen them from a distance, but you have never had a close encounter with them. If you have, it may not have been good. You may even have seen some of your friends, or family members, treated cruelly or killed by them. Would you learn to trust them quicker if you were constantly trying to run away from them, or if you were confined to a set area where nothing bad happened to you? 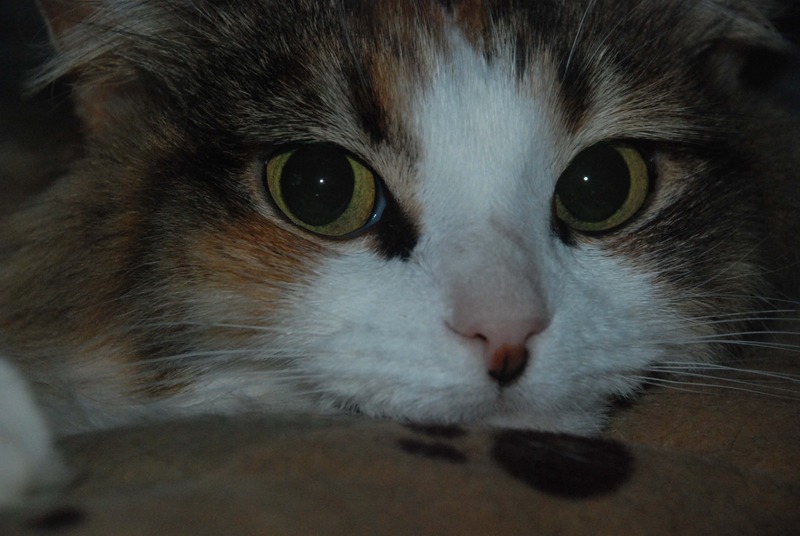 To an unsocialised cat, you are the giant monster. They get used to us giant human monsters quickest if they’re confined to a small area, which will become their new ‘territory’. Depending on how frightened they are, their sanctuary space can either be a comfortable room, like a bedroom, or a 42 -48″ wire dog crate. If they start off in a crate, they’ll ‘graduate’ to a room once they’ve reached certain milestones, before graduating to the rest of the house. But I don’t want to put them in a crate! 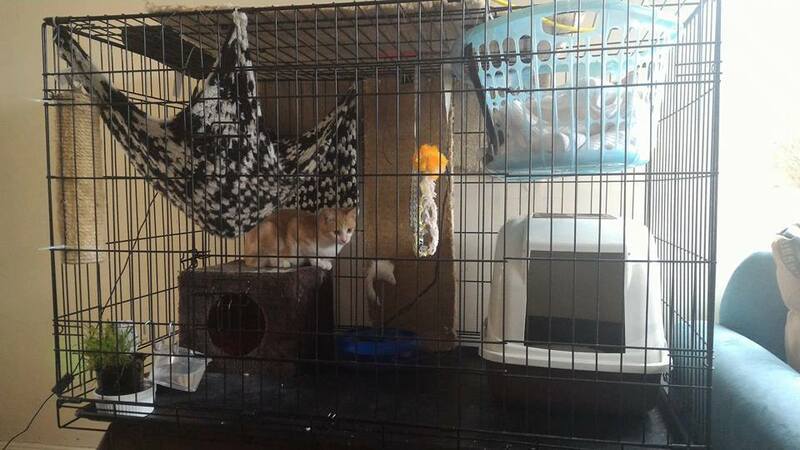 Having your cat in a socialisation crate may seem really weird at first. You might even think it’s unkind. Think of it like this: if you were to break your leg, you’d probably get a cast so that the bone sets properly. Having your leg in a cast will be limiting. You won’t be able to do things you normally do; showering will be fun; and you’ll get really itchy. But without the cast, you may end up permanently impaired, never able to walk without pain or live the life you’re used to. The cast means a temporary loss of quality of life for long-term good quality of life. Using a crate is similar. Your scaredy cat will overcome their fear of people, feel safe in their foster home and be able to strut their stuff to adopters much sooner. They won’t be living in a perpetual state of fear and will be able to enjoy being waited on by their loving human servant. Many a time, we have observed foster carers who were reluctant to use a crate feel frustrated that their timid cat wasn’t making progress. Once they tried a crate, their foster kitty came along in leaps and bounds. Whether you need a crate or a room will depend on how frightened they are. When we welcome a new foster cat, if we know that they’re timid (the pound or shelter will usually have some idea), we tend to start them off in a crate so that we can assess them. It’s much, much, much easier, and less stressful for them, to let them out of a crate into a room than get them into a crate when they’re paralysed with fear under a bed! You might be able to get an idea of their fear level when they’re still in the carrier, through their body language. 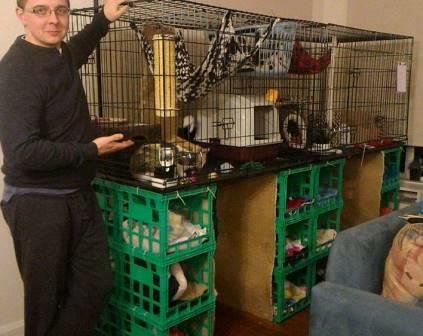 You could start them off in a room and, if they’re not making any progress after a couple of weeks, move them to a crate. Just be aware that that is easier said than done. Collapsible wire dog crates are convenient, inexpensive and easy to disinfect. We recommend the XXL size (48″) or 42″. Your cat may be in there for a while, so it’s important that they have room to move and can get at least some exercise. These are cheapest to buy online. They come with a plastic tray that can be slid out and doors on two or three sides. Put the crate where you and your family spend most of your time, so they’re exposed to all the household goings-on – living room, your bedroom, your office etc. If at all possible, position it so they have a view to the outside – trees, birds, pedestrians. They will be happier if they have something interesting to look at and keep their mind occupied. Place the crate two to three feet off the ground, so you don’t tower over them. Coffee table, dining table, desk, bricks, milk crates, storage tubs all work. Karyn and Brodie use milk crates to give height. Two crates have been linked, to give more space. The photo was taken at night, with the blind down, but the right side has a view from a window. Familiar scents Cats have an incredible sense of smell. Familiar scents will lower their stress. 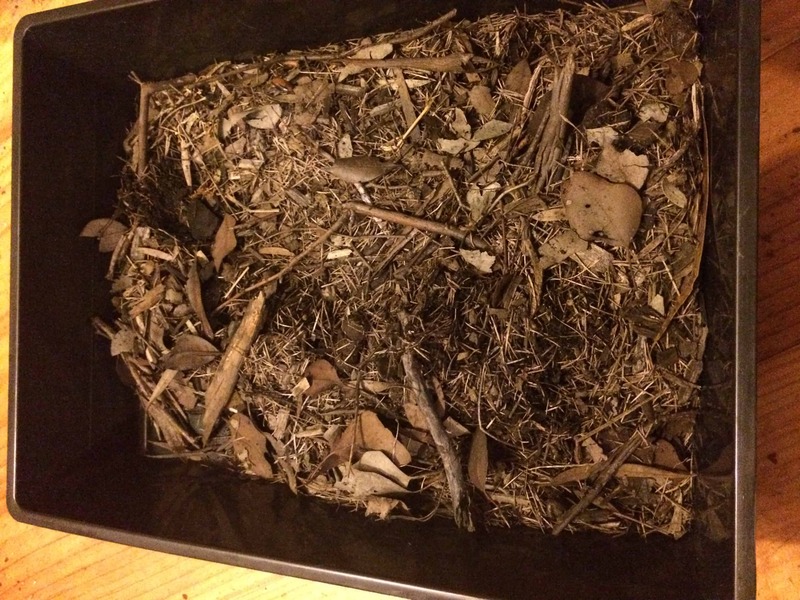 If you know where they came from, collect some soil, and/or plants, from their former home. Put the soil in a pillow case and near their igloo. Shake it up now and then. Place the plant cuttings throughout their crate. 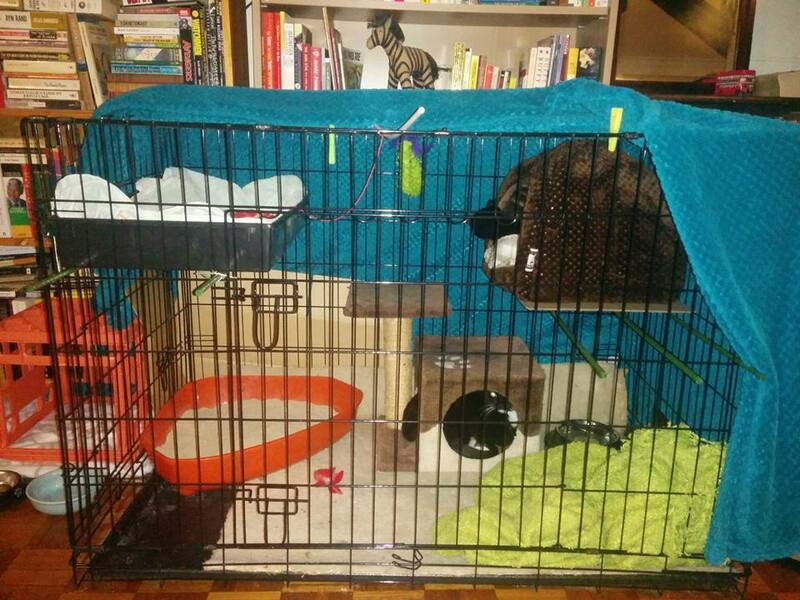 Akasha’s setup has a hiding place and a semi-enclosed bed for when she is more confident. Kirra loved her large igloo, on top of the shelf. She could hide and be up high at the same time! Amber and Charlie came into care in the middle of winter. A cardboard lettuce box, with one side cut off, meant they could have a heated bed and a room with a view. Brothers Zimba and Zebedee weren’t as frightened as some and didn’t need a hiding place. They loved sleeping together in their ‘double bed’. Siblings Ambrose and Sheridan had two shelves, a hiding place and a double bed. They slept on top of the hiding place, instead of in it, once they were settled. Feliway diffuser, Kong Wobbler and a Kickaroo toy reduce stress and give some stimulation. A carpet offcut on top of the tray means they don’t have to walk on plastic. Hannah’s setup gives two hiding places and makes use of height. 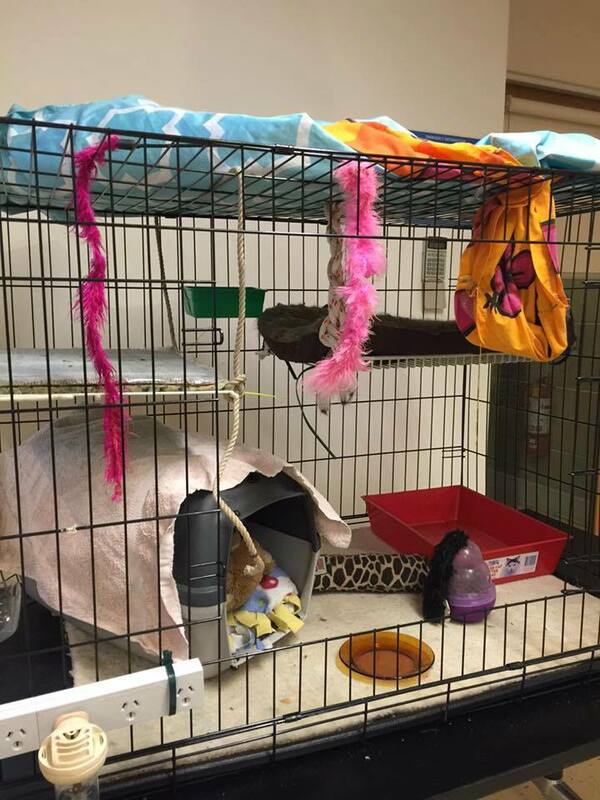 Karyn and Brodie have been creative in making unusual beds. Again, height is used to help cats feel safer. If they’re not too terrified of humans, they can start off in a small comfortable room, with the door kept closed. Even better, stack two extra tall baby gates on top of each other, and leave the wooden door open. They can then see, hear and smell the rest of the household and are less isolated. Two extra tall baby gates, stacked on top of each other, confine your scaredy cat and mean they can see and hear the rest of the household. 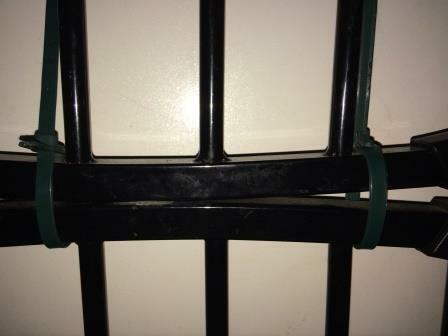 Hold the gates together with removable cable ties, so that they open like a normal swinging door. Depending on how frightened they are, they may take longer to socialize than if confined to a crate. It’s best if they can’t hide in inaccessible places e.g under a bed, behind a wardrobe. Make sure you don’t have windows open more than 2cm, or they may get out. Check that a cat can’t push windows further open. This is very important even if they’re in a crate – believe it or not, they can get out of a crate if they’re determined enough! Timid cats are very hard to find once they’re out of a home and you’ll usually need to search for them – for days, weeks or months. Prevention is waaaay better than cure.